1. Firstly, note that we will work with 2 cooktops simultaneously. Place a pot with plenty of salted water on one cooktop. Bring it to a boil and add the spaghetti. 2. When it starts boiling, place a large frying pan on the second cooktop and heat the olive oil. Sauté garlic until browned and then remove it. Add the cherry tomatoes and cook until they open. Add half the rocket and continue cooking, stirring constantly. Add a bit of salt. 3. When spaghetti is ready, add it to the frying pan with the cherry tomatoes and the rocket, adding a bit of juice from the pot as well. All of this must be done without stopping stirring. 4. Remove the frying pan from the heat and add the rest of the rocket and plenty of pepper. Scatter the cheese on top and mix well. 5. 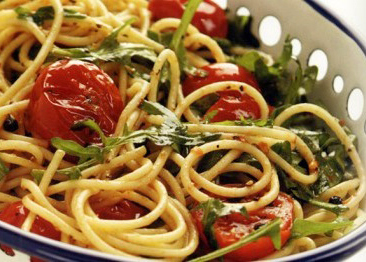 Place the spaghettata in a platter and serve it warm. Even better, don’t remove it from the frying pan but serve directly from it.